The present Chief Incumbent of the Gangaramaya Temple, VenGalabodaGnanissaraThero has reached his 55th year since being ordained as a Buddhist monk. 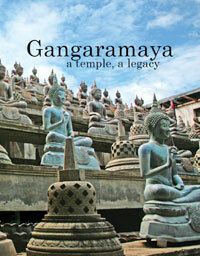 This book aims to give a comprehensive insight of the Gangaramaya Temple, its Chief Incumbent – “PodiHamuduruwo”, from a religious, cultural and societal standpoint to underscore its importance and relevance today. ← In conjunction with the 55th anniversary of the ordination of Ven Galaboda Gnanissara Thero, the following activities have been organized at the Gangaramaya Temple for its devotees.